The Farm Labor Contractor Statement of Pay Rates is a miscellaneous law poster by the California Department Of Industrial Relations. This poster is mandatory for some employers, including farm labor contractors licensed by the division of labor standards enforcement. This poster, posted in English and Spanish, must be posted in a conspicuous place where all employees will see it for farm labor contractors. This poster describes the type of job offered, the wages for that job and who is going to be doing the job and where. Must be at least 12 inches high and 10 inches wide. It appears you don't have a PDF plugin for this browser. 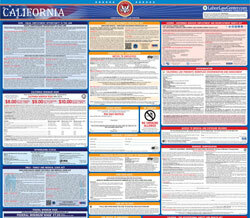 Please see the link below to download california-dlse-445.pdf.